Singapore, 24 August 2011 – Fans of K-pop have good reason to bring the house down this September at the 2011 FORMULA 1 SINGTEL SINGAPORE GRAND PRIX. For the first time ever, Singapore GP has added the dynamic trio of Korean pop stars GD&TOP AND SEUNGRI to a line-up of world-class acts at the only Formula One night race. Better known as G-Dragon, T.O.P. and Seungri of the massively popular band BIGBANG, this powerhouse trio will drive fans wild with their polished dance moves and infectious tracks at the Padang main stage (Zone 4) on Friday, 23 September. G-Dragon and T.O.P. 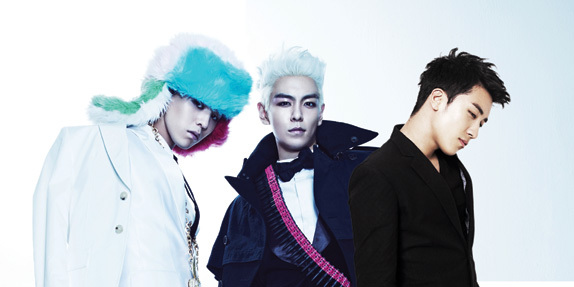 (GD&TOP) debuted with the album GD & TOP in 2010 and released three singles 'High High', 'Oh Yeah' and 'Knock Out'. Their music is a brilliant hybrid of hiphop and rap, infused with electro, pop and acoustic elements. With their edgy persona and a series of chart-topping successes, GD&TOP has quickly earned a reputation as the "ones to watch" in the Korean music industry. Joining his BIGBANG mates is the multi-talented Seungri, a hip-hop performer, actor, record producer and songwriter who released his solo mini-album VVIP in 2011. While the album's groovy tracks like 'VVIP' and 'What Can I Do' showcase Seungri's vocal prowess, the music videos effectively demonstrate his magic on the dance floor. To start your party on a high note, don't miss this one night only live performance by GD&TOP AND SEUNGRI on Friday. With just one ticket, fans can enjoy all-day entertainment and hours of race action at the Marina Bay Street Circuit. A Friday Single-Day Walkabout ticket priced at S$38, gives fans access to three entertainment stages in Zone 4 as well as plenty of bleachers offering vantage views of the Formula One track action. To get the most out of the race weekend, Three-Day Grandstand tickets priced from S$298 are also available. For the latest entertainment updates and performance schedule, visit www.singaporegp.sg closer to the race. Tickets are available for sale online (www.singaporegp.sg), via the ticketing hotline +65 6738 6738 as well as at all SISTIC outlets.